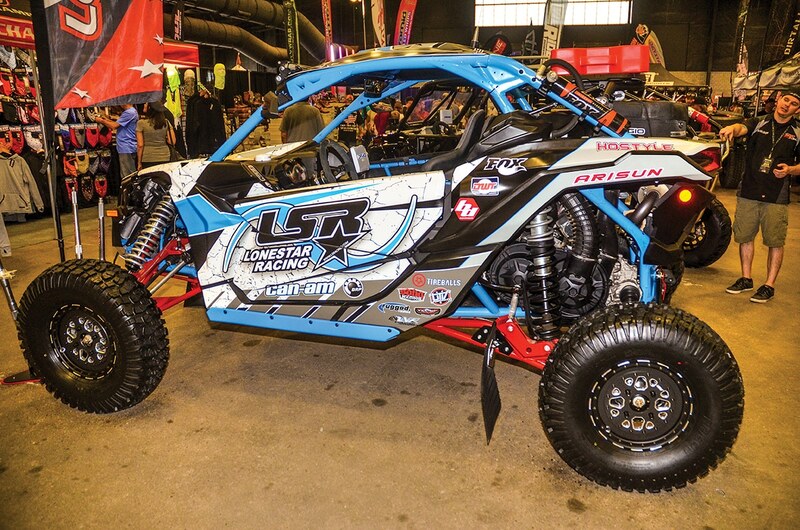 Like California, Arizona has its own Sand Show and Off-Road Expo where Arizona’s many aftermarket companies show off their latest and greatest products for UTVs. We attended the Off-Road Expo to check out the new technologies in suspension, turbocharging, tires and wheels, lighting, navigation, sound, and comfort for our high-performance UTVs. 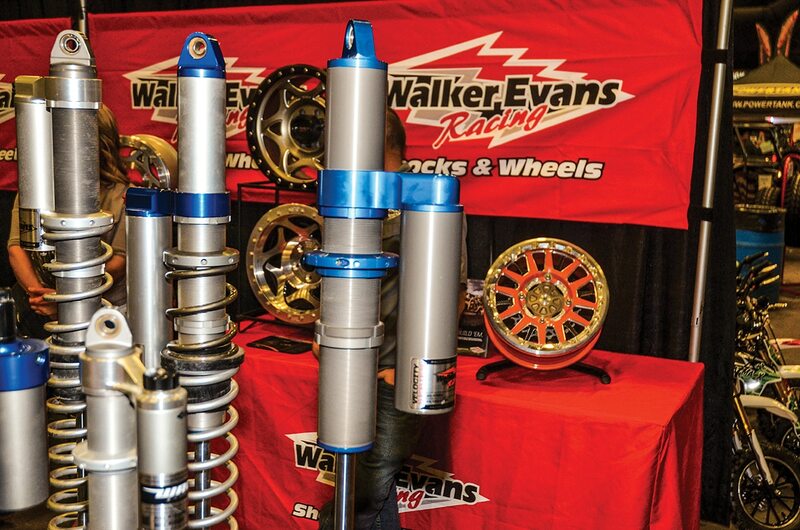 Walker Evans Racing is developing its own smart suspension. 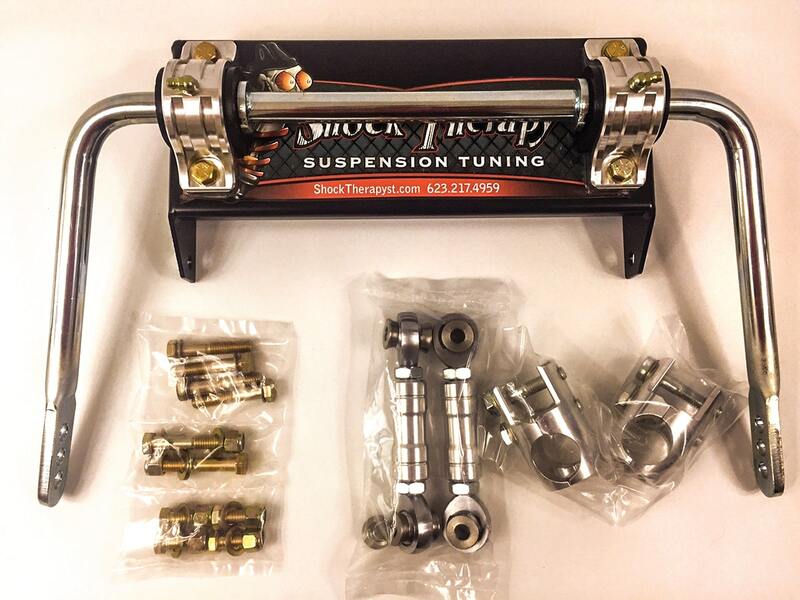 The Strike Eclic is a mechanical solenoid for on-the-fly adjustment of newer 2.5-inch RZR shocks (OEM needle, Velocity and other piggyback shocks). See www.walkerevansracing.com or call (888) WEE-RACE. 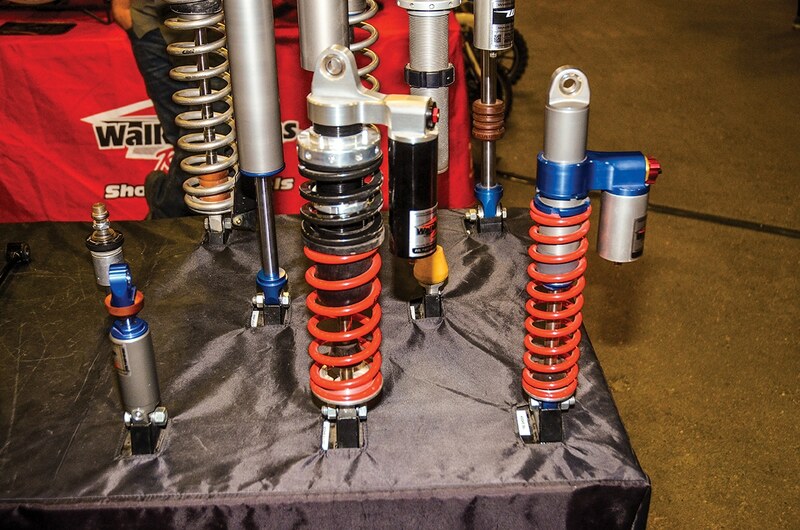 Knowing how important family is, WER also developed RZR 170 2.0 and 1.75 shocks. 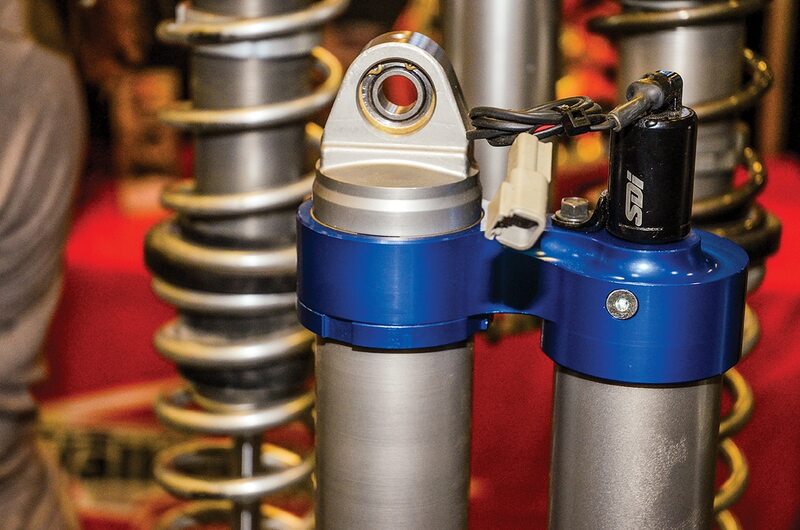 Front 1.75 piggybacks and rear remote-reservoir 170 shocks are $394.99 each and have adjustable compression, while piggyback 2.0 shocks are $443.99 each and feature dual-speed compression adjusters. WER has the RZR XP1K and Turbo covered with a new Velocity Series 3.0 rear shock that will have all the features of the Velocity 2.FIVE—dual-speed compression adjusters, dual-rate springs with cross-overs, billet-aluminum construction, Viton shaft O-rings, steel FK spherical shock-end bearings and stepped needle progression with mid-body reservoirs. 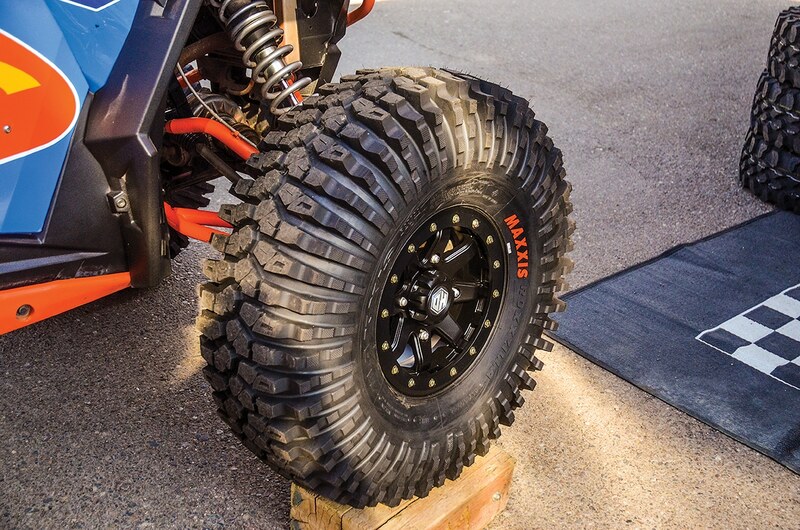 The Maxxis Roxxilla only comes in 30x10R14 with an eight-ply rating, soft tread compound and multi-layer sidewall for added rock-crawling traction. Maxxis will soon introduce the 35x10R14 Roxxilla. 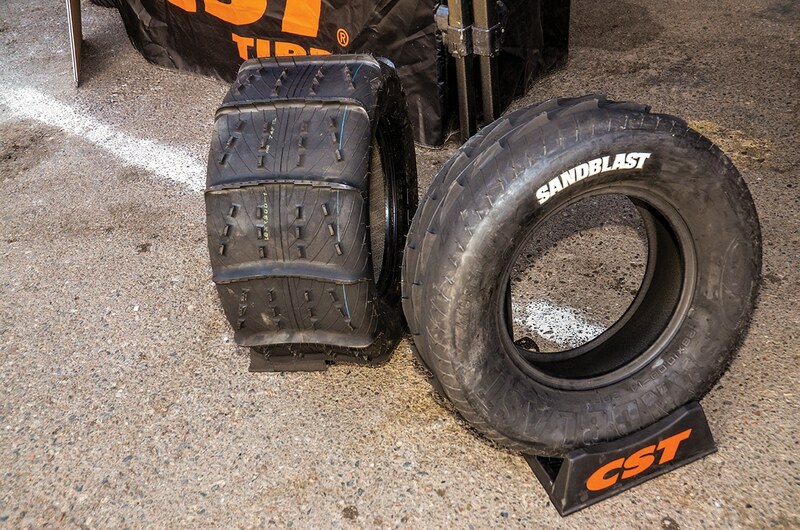 CST Tires add 32×10-15 and 32×10-17 fifteen-paddle sizes to the Sandblast tire line (28×10/12-14 twelve-paddle and 30×10/12-14 fourteen-paddle). The two-ply paddle tires have dual-staggered front knobs for quick steering and 15-paddle rears with four rows of knobettes for maximum traction. MSRP is $180–$222, but they are $135–$170 online. 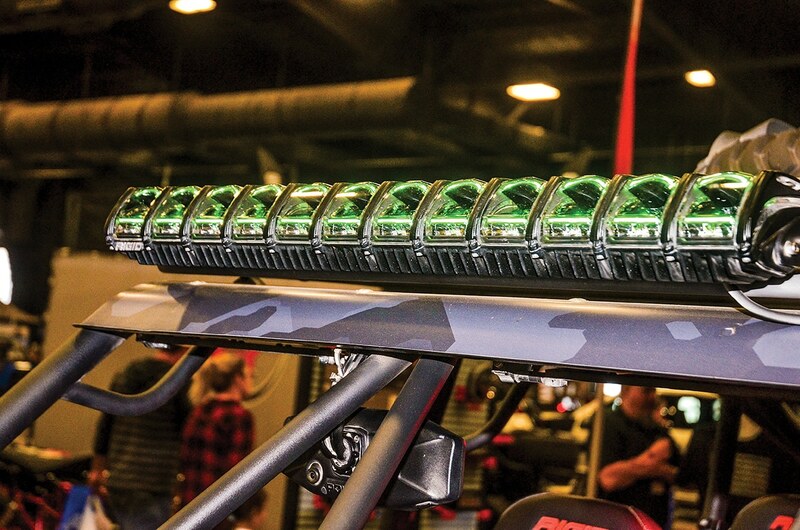 Evolution Powersports (EVP) introduces its V-Map multi-map tuning for the Maverick X3, which utilizes the OEM Sport/Eco switch to toggle between EVP’s Stage 1 (190 horsepower) tune for 91-octane fuel in Eco mode and EVP’s 213-horsepower Sport mode tune for 95+ octane fuel. See www.evopowersports.com or call (970) 680-3861. EVP also has a Sandblaster Stage 6 Big Turbo kit ($3,499-$3,749) with a 5mm-larger compressor and more flow within the OEM header/exhaust housing. The results are 26-plus pounds of boost and 209 wheel horsepower with E85 fuel and 193 wheel horsepower on 110-octane fuel. EVP’s RZR XP Stage 6 Turbo is $3399 and makes 240–250 horsepower. 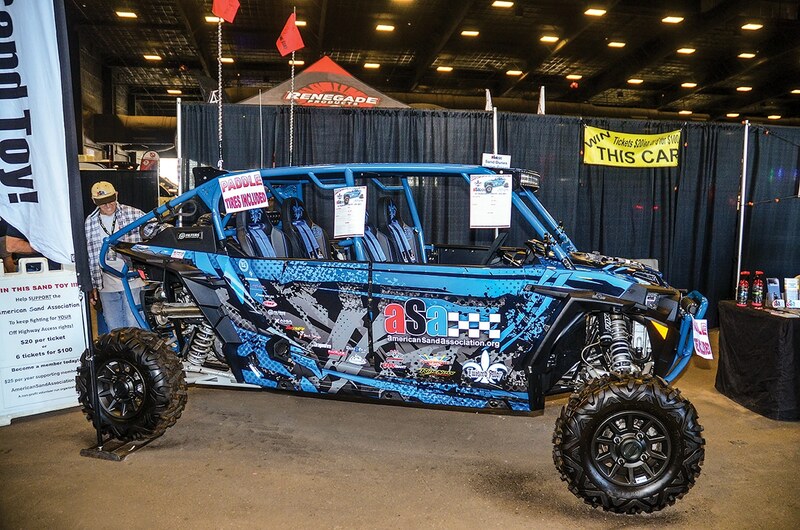 Here’s the 2018 American Sand Association’s raffle RZR XP 4 Turbo EPS by Twisted Alloy and 20 other sponsors. It will be raffled off on September 16, 2018, at the Sand Sports Super Show. ASA raffle tickets are $20 or six for $100. Call (888) 540-7263. An ASA membership is $25, and you get a $25 gift card from Rocky Mountain ATV/MC! 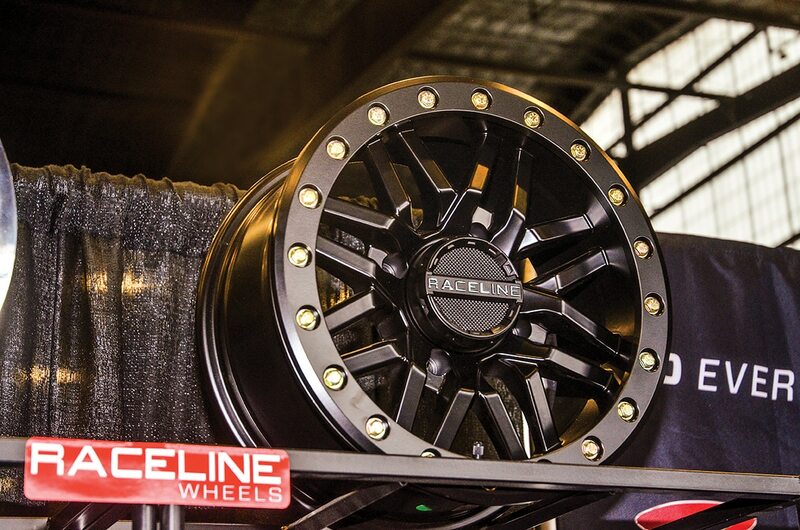 Raceline has a new A91 Ryno beadlock wheel with recessed beadlock bolts in black or grey. The Ryno comes in 14×7 ($185.95) and 15×7 ($212.95) sizes with 5+2 offset (10mm) and in 15×10 ($238.95) with 5+5 (0mm) in 4×110, 4×137 and 4×156 bolt lug patterns. See your Raceline/Arisun dealer. 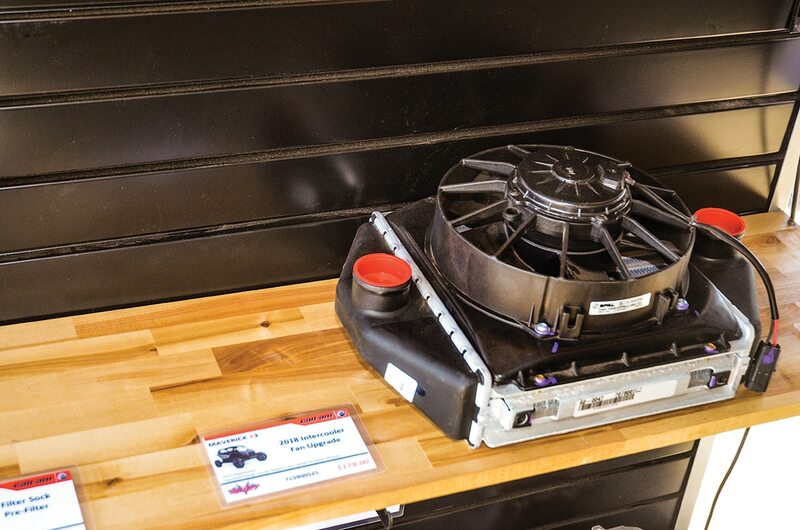 EVP also has a Base X3 Upgrade kit ($1349–$2199) that includes an OEM X3 intercooler with fan, EVP silicone charge hoses with blow-off valve port, clamps and ECU re-flash with options from the stock 120 horsepower to 180 horsepower on 91-octane fuel all the way up to 200 horsepower with EVP exhaust, larger injectors and 8-psi waste-gate mods. brake-light function. They are 4 or 6 feet long and start at $182 each. See www.quick-light.com or call (831) 596-0550. 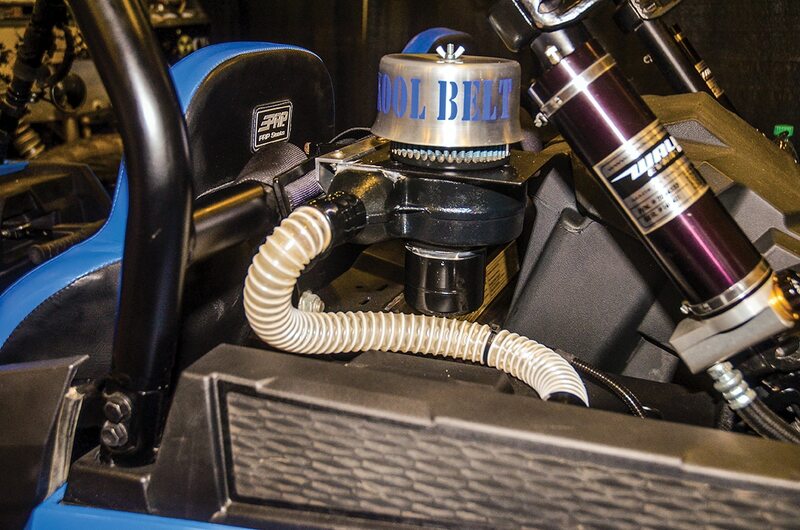 Kool Belt Systems’ converted Parker Pumper clean-air pumps are for use as forced-induction cooling systems for the Polaris RZR XP 1000 and Can-Am X3. Either kit is $299. Or, go with a two-hose Parker Pumper and direct one hose to your helmet. See www.koolbeltsystems.com or call (714) 988-3289. 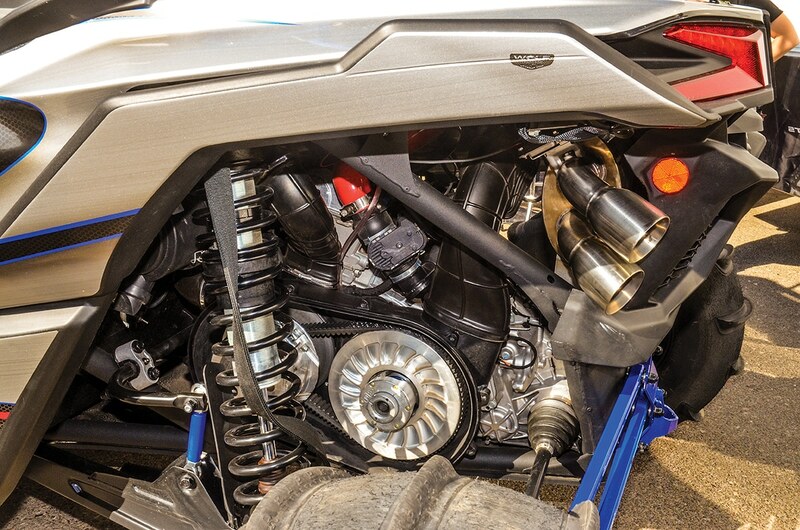 Shock Therapy has a new front torsion bar for the Yamaha YXZ1000R and Sport Shift that starts out 180-percent stiffer than stock and gets stiffer as you mount the link on the inner holes. Get less body roll, higher cornering speeds and more high-speed stability for $649.95. 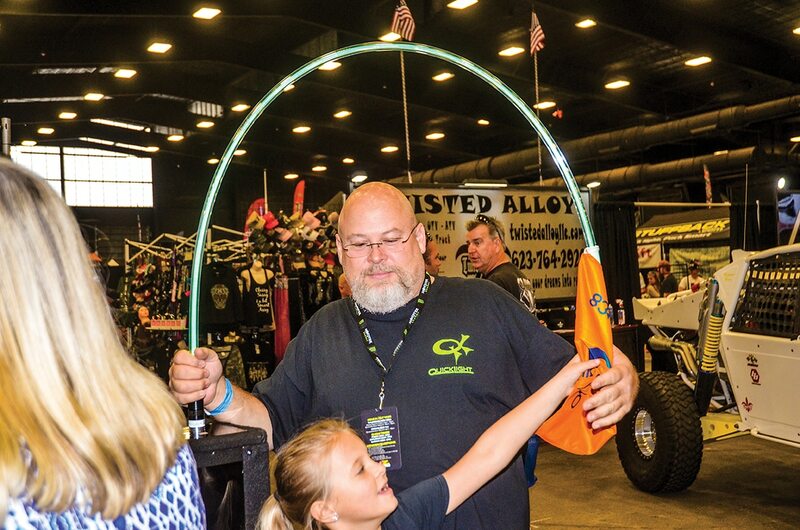 GG Lighting has a cool white/red/amber UTV LED rear bar for only $200, and GG Lighting also has a remote-controlled 5-foot LED whip with quick-connect base for $124.99. See www.gglighting.net or call (714) 341-4811. 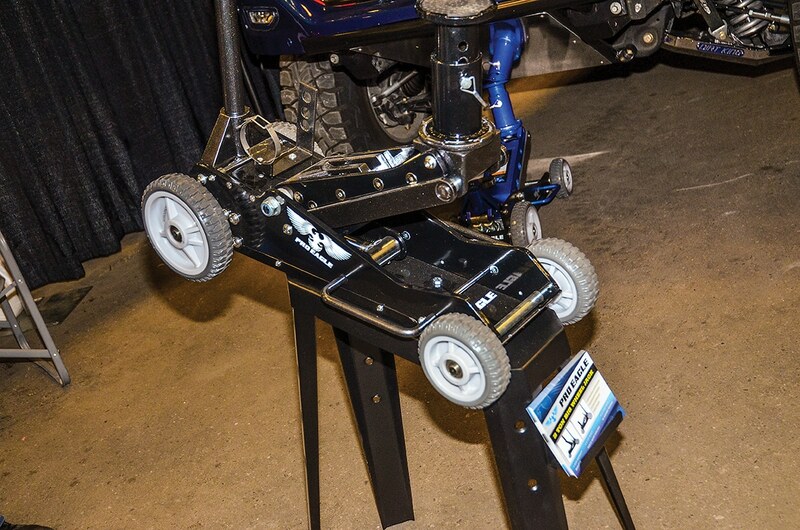 Pro Eagle has off-road big-wheel floor jacks with a 6000-pound capacity and 2.25-foot lift with adjustable extension. Composite wheels, solid-steel axles and a skid plate make if tough, and it has a two-year warranty. It’s $459.99, and a 2-ton jack with caster wheels is available for $279.99. Call (310) 513-8222 or see www.proeagle-products.com. MTX Audio has a RZR XP system that includes a dash-mounted Dual Amp, under-dash subwoofer, two dash-mounted speakers and rear pods for $1,353.45. 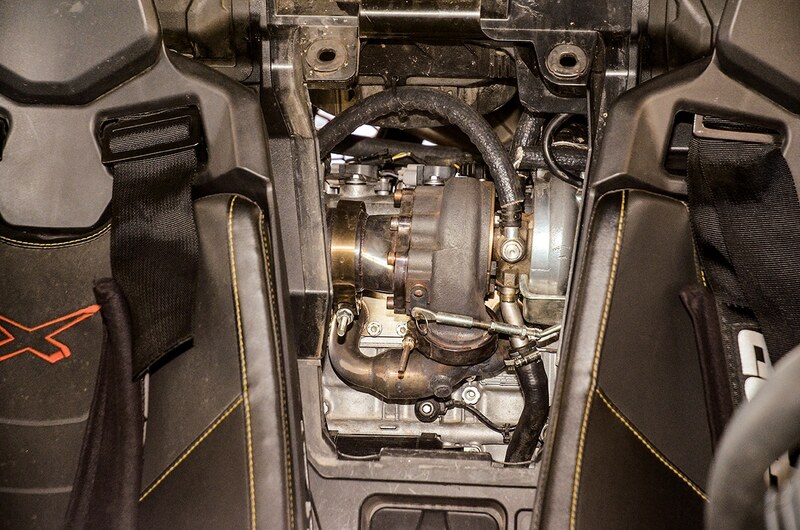 Owners of the new Dynamix Edition Turbos stay tuned, as MTX is working on speaker kits to complete the speaker-less Ride Command audio system. 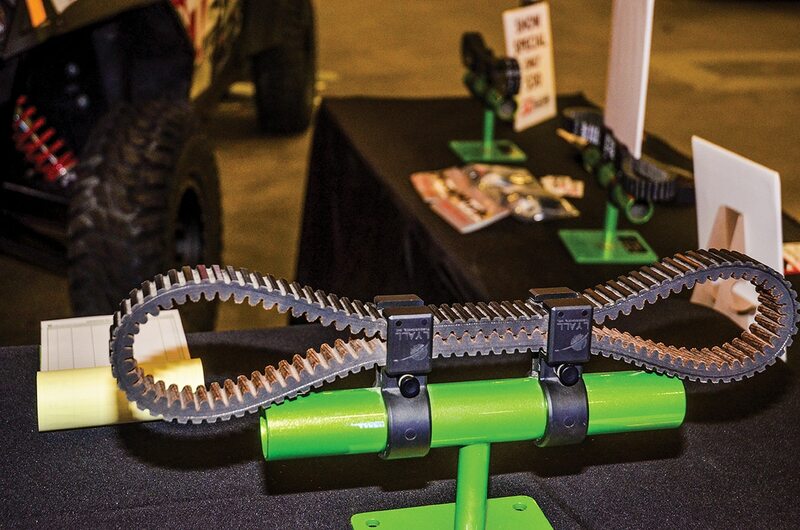 For those who zip-tie spare CVT belts to their UTV’s cage, DT Racing has a better way to mount belts and a faster way to retrieve them. 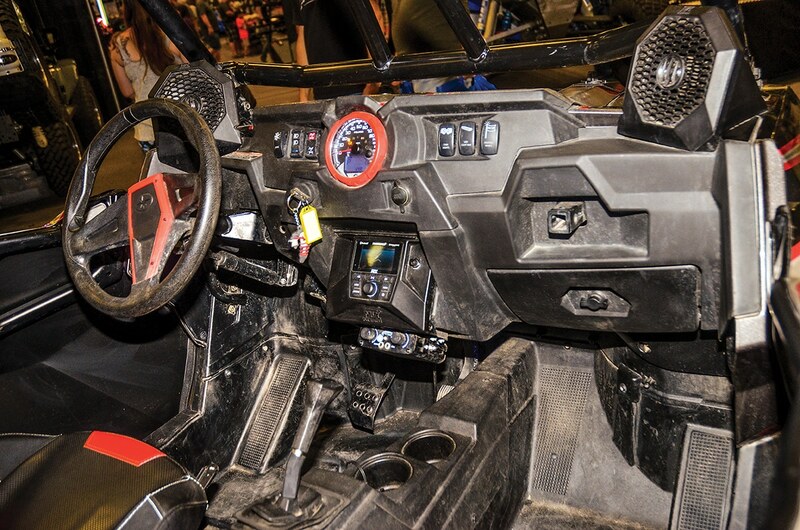 The UTV belt mount fits any 1.75-inch tube and accepts RZR 800 Turbo, Maverick, Maverick X3 and Teryx CVT belts. Push two buttons to release instead of cutting ties. MSRP is $35, but Rocky Mountain ATV/MC has it for $29.99. Or, see www.dtracingus.com. 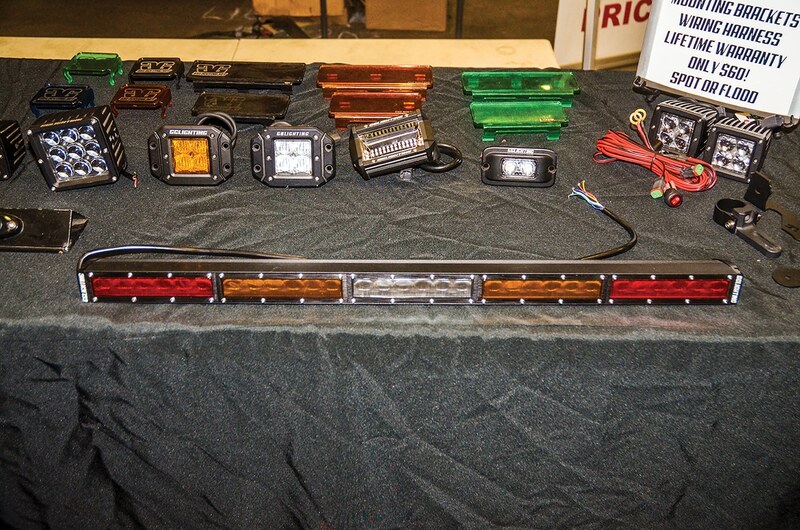 Rigid Industries introduces Adapt LED light bars, the first lighting to instantly adjust to driving conditions via Active View technology. Choose the 10-, 20-, 30-, 40- or 50-inch LED bar, and Adapt includes the dash control, under-dash module, harness and mounting hardware. 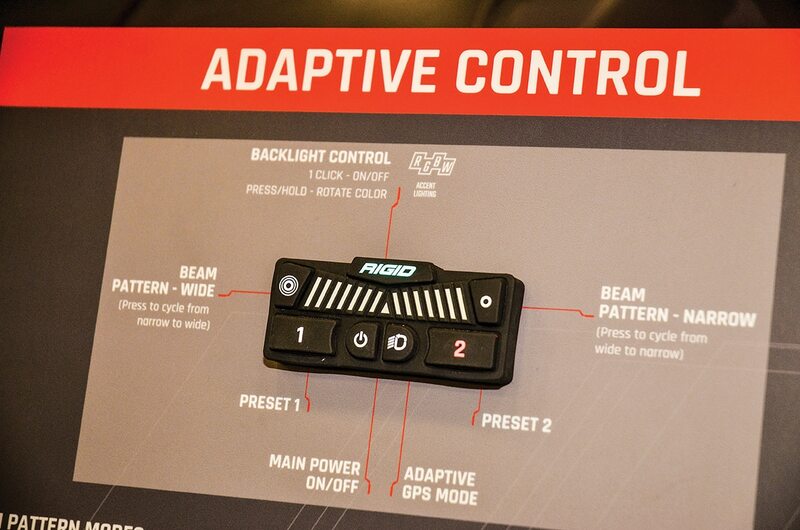 Adapt has eight modes with varying combos of flood, driving and spot patterns, and Adapt chooses the mode based on vehicle speed. Or, use the dash control with RGB-W accent lighting, two preset modes and toggles for cycling through modes. MSRP is $829.99 to $2799.99. See your Rigid dealer or www.rigidindustires.com.